The record collectors used to call it “junking,” but it’s more elevated (cleaner, brighter lighting, safer environs) these days. Goodwill and the Salvation Army are usually well-stocked with Andy Williams and Donna Summer vinyl, although oddities still pop up — SONGS OF THE RED ARMY, for one. But the Beloved and I like thrift stores — for wardrobe choices that go beyond the Ralph Lauren racks at Macy’s, for odds and ends (a salad spinner, an unusual coffee mug, intriguing books). And their supply of records is usually more interesting. 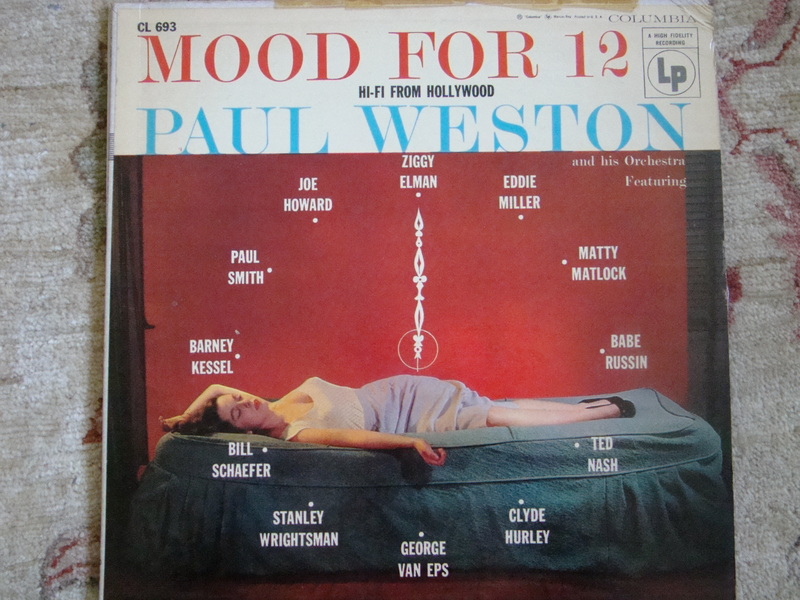 As Marc Myers would say (he loves the subtexts of odd Fifties record covers), we hope she is enjoying the music — another bachelor pad fantasy, but the woman who liked Clyde Hurley playing a ballad would be a real keeper. A very different approach to female pulchritude and the male gaze, no? I might have this music on CD, but felt it would be terribly disloyal to be in the SF area and pass this record by. Madam here likes jazz piano! 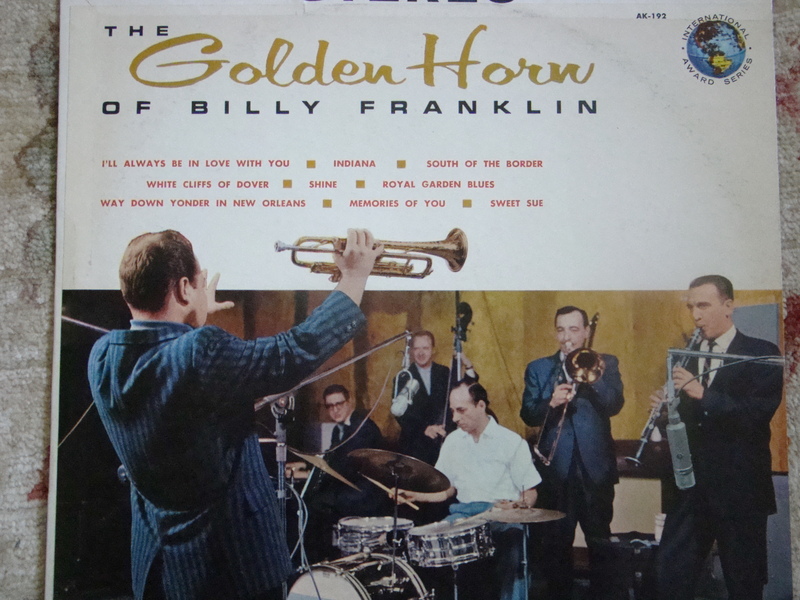 With this one, we’re clearly into the unusual — even though it seems to be a supermarket label and I’ve never heard Billy Franklin play. (Is it possible that it was a pseudonym?) 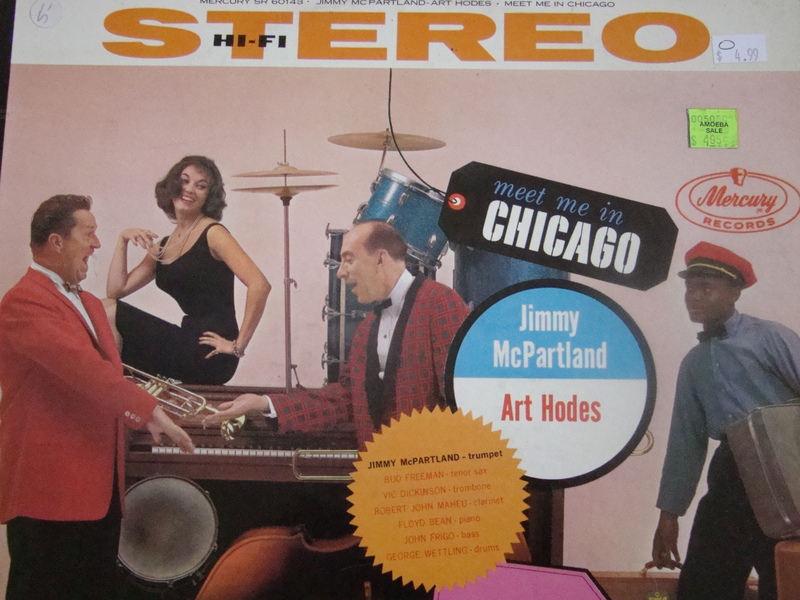 But the accompanying band is first-class: Mousey Alexander, drums; Hank D’Amico, clarinet; Hary DiVito, trombone; Whitey Mitchell, bass, and a very young Johnny Varro, piano. I don’t think I’ll be sufficiently organized to bring this disc to the Sweet and Hot festival to show Johnny, but perhaps. And the songs are hopeful, too: I’LL ALWAYS BE IN LOVE WITH YOU / INDIANA / SOUTH OF THE BORDER / THE WHITE CLIFFS OF DOVER / SHINE / ROYAL GARDEN BLUES / WAY DOWN YONDER IN NEW ORLEANS / MEMORIES OF YOU / SWEET SUE. 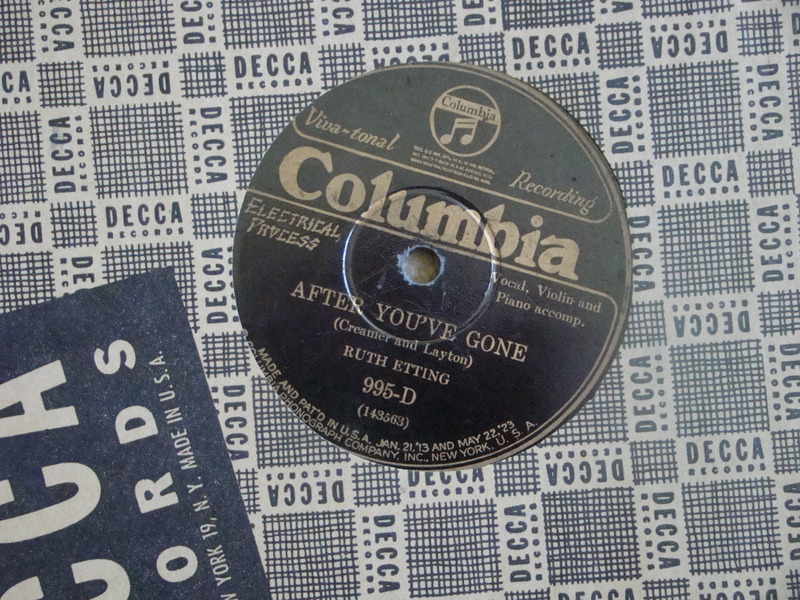 In many thrift and second-hand stores, the 78 rpm records there are often ancient classical, overpriced Edisons, Teach Your Canary To Sing, 4 Top Hits, or the like. 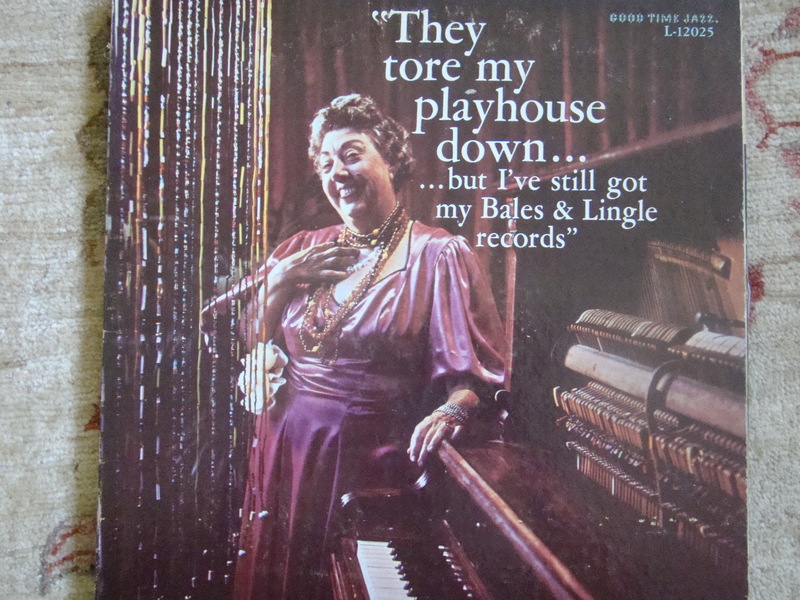 One of the stores had three paper albums and a number of loose records — the usual Sinatra and Gene Autry, but someone’s favorites from 1930-1, which I bought indiscriminately. Who knows which Columbia or Victor dance band record is hiding a yet-undiscovered Jack Purvis bridge? Oscar Grogan? But the other side is Richard Whiting’s HONEY, which is usually performed at a medium tempo, so it’s hopeful. Now, there’s a prize! The reverse is MY MAN. Probably quite sweet rather than hot, but for a dollar, everyone might take a risk. 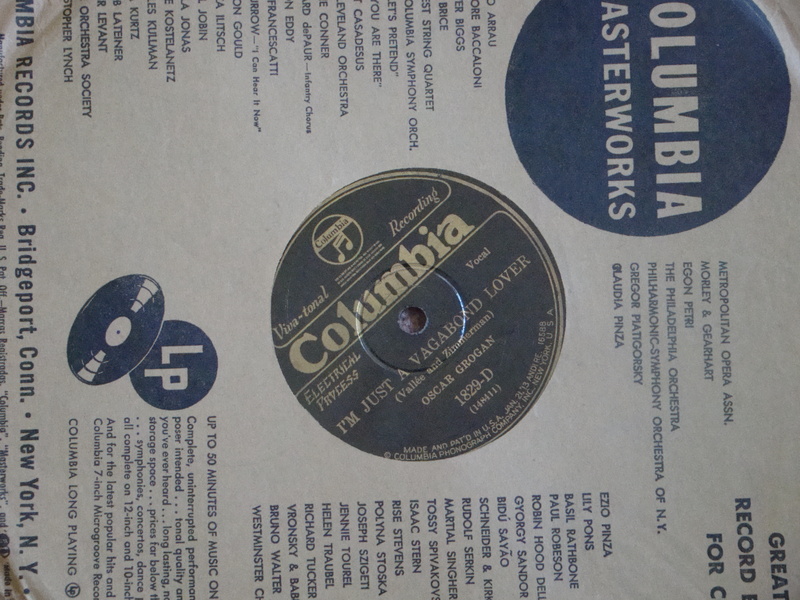 The other side is INDIAN LOVE CALL, and I hope it’s a precursor of Louis with Gordon Jenkins, Tony Pastor with Artie Shaw. One other photographed poorly, so the titles will have to suffice: ME AND MY SHADOW (Johnny Marvin: “The Ukulele Ace,” with Clarinet Accompaniment) / MY SUNDAY GIRL (Charles Kaley, with Violin, Saxophone, and Piano): Columbia 1021-D. The heart imagines Jimmy Dorsey, Joe Venuti or Matty Malneck, Arthur Schutt . . . 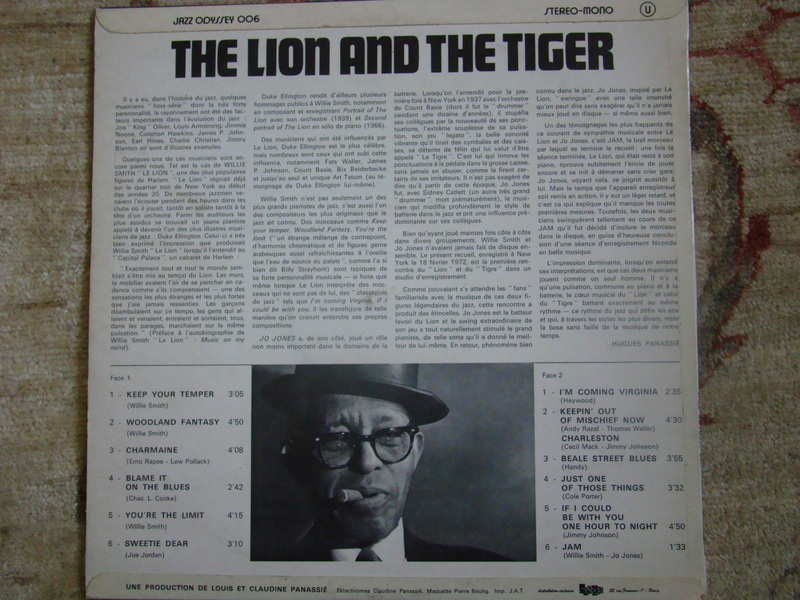 I had this a long time ago, and it disappeared under unhappy circumstances: although Willie “the Lion” Smith and Jo Jones should have recorded in every decade prior to this, it’s a blessing that Hughes and Louis Panassie got them into a studio for this and another session as well. 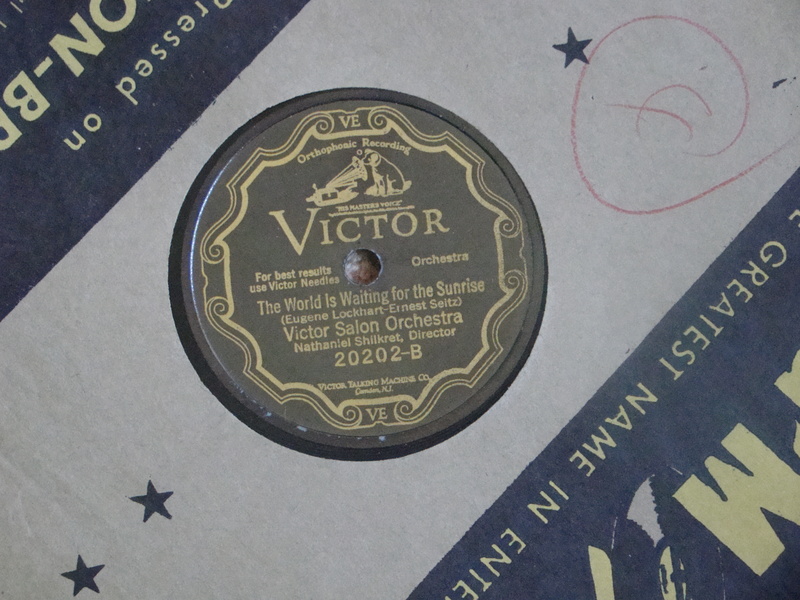 I have heard the music from this two-band-spectacular, but it’s nice to have it on disc — with George Wettling, Nappy Trottier, Jack Maheu, Georg Brunis, Pee Wee Russell, Johnny Frigo, and Vic “Dickinson.” The photograph of Jimmy and Art giving each other some skin is a good one, even if it’s a tossup whether the pretty model at rear left or the “redcap” looks less convincing. Maybe Method acting hadn’t hit the Chicago studios yet? I can’t wait until I encounter a three-speed turntable!